The pretentiousness of this movie pisses me off. It’s like the producers thought that if they threw $80 million (or whatever the budget was) at a pile of crap, they could assume it would warrant a sequel. Diane frickin Lane is wasted in, literally, three minutes of screen time only to set up a sequel. Good movies earn their franchise status. JUMPER does not. The basic plot involves Anakin Skywalker learning he can teleport. 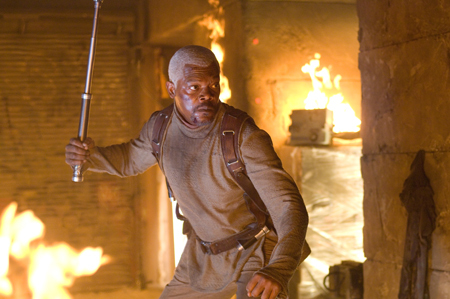 Jules Winnfield thinks this goes against what God wants humans to do, so he tries to kill Anakin. I watched JUMPER (2008) on 1.15.09. It was my first viewing of the film. ~ by johnlink00 on January 15, 2009.